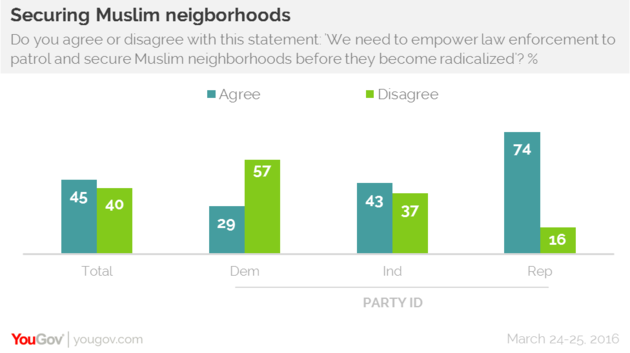 Two new polls released this week show that upwards of half of all Americans agree with Republican presidential candidate Ted Cruz's response to last week's terror attack in Belgium with a plan for police to "patrol" Muslim neighborhoods in America. "Have the terrorists won?" the press release announcing the poll's findings asked, explaining that "A majority of Americans voters appear to be willing to do whatever it takes, even backing what amounts to a revocation of essential American liberties and ideals, in an effort to keep us safe." Another poll out this week confirms that more Americans are in line with the Texas Tea Party senator's direction of handling potential terror threats within U.S. borders than are with New York Police Department Commissioner Bill Bratton, who blasted Cruz's “lack of knowledge” and called on him to "shut up," arguing that profiling and mass surveillance hurts counterterrorism efforts. Both polls also found that a majority of Americans support Republican presidential frontrunner Donald Trump's call for a temporary ban on Muslims entering the United States. 51 percent in both the Morning Consult and the HuffPost/YouGov poll said they support banning Muslims entering the United States. The HuffPost/YouGov poll notes that the number is slightly up from the 45 percent support when the question was first asked after Donald Trump proposed the ban in December. Almost half of voters — 45 percent — in the Morning Consult poll also think the U.S. "needs to stop tying its hands and start using enhanced interrogation techniques, such as waterboarding, against suspected terrorists in order to defeat ISIS."